Gateway to Learning stopped by today to learn a little about screen printing. 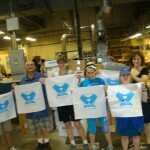 We had a good time showing them how things are done while printing napkins for Dorothy’s Can-Do Café. A good time was had by all. Check them out on Facebook and give them a like.